I’m a libertarian at heart, and as such, I believe that, with few exceptions, pretty much the worst entity to handle any task is a government body. Therefore, over a decade ago, when Californians were sold a pipe dream about a high-speed rail (HSR) that would whisk them from San Francisco to Disneyland in just 2.5 hours, I rolled my eyes. Hey, hold on Tim! You said the residents of Palo Alto would be suffering with all that train construction! You got that wrong, right? Nope. In spite of this cancellation, the good people of Palo Alto are STILL going to proceed with totally reworking the rails. Plenty of noisy construction going on for years is around the corner. So I’m 2 for 2 on the declarations above. The shame of it all is how obvious this was. The original estimate for the high speed rail system was relatively modest. But it kept growing, growing, and growing, approaching $100 billion. And I can absolutely guarantee that if they allowed this boondoggle to continue, it would have wound up much, much more. And God knows when it would have been finished. The latest estimate was 2033, which probably means 2050 or so. They. Didn’t. Read it. OK. 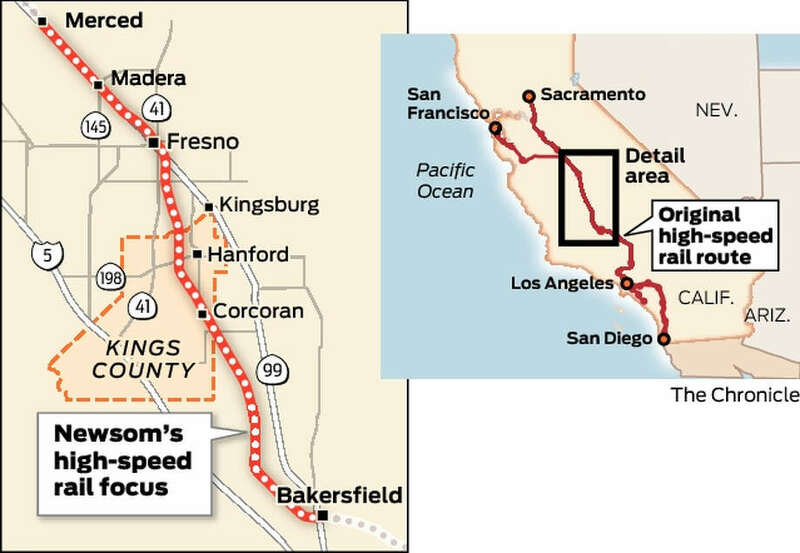 So now that billions and billions of dollars have been flushed down the toilet, here’s the topper: they’re STILL going to complete the so-called HSR between two points: Merced and Bakersfield. You may not be acquainted with California well enough to know about these two bits of paradise, but let me put it to you this way: if you wanted to choose the poorest, more boring, most depressing points in the state of California, they would probably be Merced and Bakersfield. They’re sort of the left and right armpits of the state. Wrong and offensive. WHAT? The reason “some critics” would describe it, Governor Newsom, as “a train to nowhere” is because……..IT IS!!! If you want transparency in government, I guess this is it. So the truncation of this project has taken on an absurd turn. What has happened would be the equivalent of telling your children that you’re going to have a fun family vacation at Disneyworld. They wait. They anticipate. They idealize. And the big day comes. You drive all the way down. And then, once you’re there, you announce that you’re going to do a portion of the trip: the family will walk from the car to the entrance, by way of the parking lot. And that’s it. Yes, you’re doing part of what you promised. But the portion you’re doing is the most miserable chunk imaginable. In any case, I’m glad they cancelled it. Better to throw $10 billion into the toilet instead of $100 billion. Another government success story. Destroying taxpayer wealth, one dollar at a time.